In traditional photography, people used contact sheets to get a print from a roll of film. Rather than viewing negatives, a photographer could see a thumbnail print of each frame on a roll in a few contact sheets. These contact sheets revealed how the frames would appear when printed. You can get the same results in Photoshop Elements 11 by printing contact sheets from a collection of photos. By looking over the thumbnails and choosing which photos to print at larger sizes, you save money on your printer consumables. In the Organizer, select photos you want to print on a contact sheet. Ctrl-click in Windows to choose multiple photos in a noncontiguous selection. You can also sort photos by keyword tags, albums, dates, and so on. You then select all the sorted photos by pressing Ctrl+A. Choose File→Print or press Ctrl+P. The Prints dialog box opens. In the dialog box, select the printer you want to use for your output from the Select Printer drop-down menu. 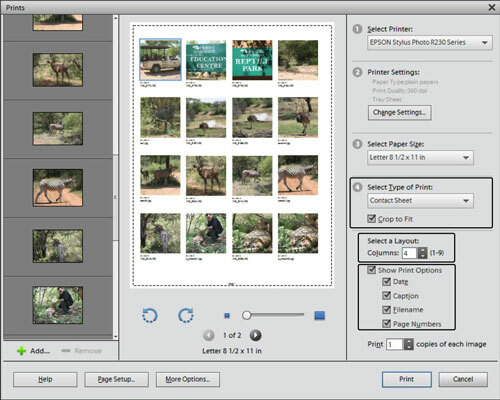 Select Contact Sheet from the Select Type of Print drop-down menu. The Prints dialog box refreshes to show your contact sheet options. Choose the number of columns you want for the contact sheet. If you specify fewer columns, the images appear larger; as more columns are selected, the images appear smaller. Choose a size according to the number of columns that you want to print. (Optional) Select the check boxes for the items you want included in the captions. If you want print options to be shown on your prints, select the Show Print Options check box, and the list of options is displayed below the check box. Caption items can include the date, a text line for the caption, filename, and page numbers. Click More Options in the bottom of the dialog box. Select a color profile from the Print Space drop-down menu. Click OK in the More Options dialog box. Click the Print button (back in the Prints dialog box) to print your contact sheet. Open the Photo Editor in Expert Mode. The Contact Sheet dialog box opens. You make choices in this dialog box for selecting photos and layouts. Click OK in the Contact Sheet dialog box. The contact sheet is built for you on the Mac and appears in the Photo Editor Image window. Choose File→Print to open the Prints dialog box. Select a color profile from the Print Space drop-down menu. Note that the More Options button is available to both Windows and Mac users.